Cobblers delivered their worst performance under Keith Curle to deservedly leave south Wales empty-handed on Tuesday evening, soundly beaten 3-1 by Newport County at Rodney Parade. Town have now gone four without a win in all competitions but this latest defeat was easily the most worrying of those, not least because their abject display bore all the hallmarks of previous troubles from before Curle took charge. Most of the damage on Tuesday was inflicted during a calamitous four-minute period in the first-half when the visitors conceded twice and gave themselves a mountain to climb, something which they never remotely looked like doing. After Andy Williams got them out of jail following Josh Sheehan’s swift opener in a lively first 10 minutes, Jamille Matt and then Padraig Ammond profited from weak, error-stewn defending to leave Curle scratching his head at half-time. The second-half came and went without major incident as Newport swept to a fully merited victory to leave Northampton 17th in Sky Bet League Two. 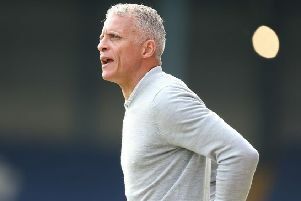 One defeat - just their second in 10 league games after all - should not be cause for panic in itself, especially given the lofty league position of the opposition, but the resurfacing of familiar defensive woes, plus a general lack of quality in forward areas, will alarm Curle going forward. Making one change from Saturday with Hakeem Odoffin in for Jordan Turnbull, Curle introduced a new system for the trip to south Wales as the Cobblers went with a diamond in midfield, leaving Williams to partner Sam Hoskins up front. But the problems began right from the word go as Curle’s men were sluggish out of the blocks and paid the price inside five minutes. Allowed too much space to play in, Newport sliced through the visitors with ease and Dan Butler teed up Sheehan to stroke into the bottom corner from 20 yards. Cobblers were not behind for long though, level just six minutes later when scoring from a hotly-disputed free-kick. Referee Andy Davies deemed Hoskins to have been fouled and David Buchanan’s delivery caused all kinds of problems for the home defence, the ball eventually dropping kindly for Williams to sweetly hammer into the net. Town were somewhat fortunate to be on level terms based on the balance of play up until that point, but their equaliser allowed them to briefly gain a foothold in the game. But brief it was with the more progressive, threatening play coming from the superior home team as Matt’s free header was just about kept out by David Cornell. Williams had a shot blocked and Shaun McWilliams fired over from range for the Cobblers, but it all went wrong in a disastrous four-minute spell around the half-hour mark. First, Town made a mess of defending what should have been a simple free-kick as Newport delivered a high, hopeful ball into the box and Mark O’Brien headed across goal for Matt to convert from close-range. Two became three within moments and again it was the product of sloppy defending with Matt streaking away down the wing before squaring to Ammond, who finished nicely into the roof of the net. The Cobblers were somewhat lucky not to be further behind by the time half-time arrived, and it came as no surprise when Curle made a change at the break. John-Joe O’Toole was the victim, replaced by Billy Waters, but still Town were second best and showed precious little sign of getting back into the contest. Newport were comfortable, happy to play conservatively and not commit too many men forward. With Town lacking quality and creativity in the final third, that was a successful ploy. The closest either side came to adding to the score was 19 minutes from time when Matt again strode into the box unchallenged before Ash Taylor and Cornell combined to thwart his effort. That aside, the second-half was something of a non-event. Williams and substitute Daniel Powell so nearly got in behind and Odoffin planted a free header over during the latter stages, but those were slim-pickings on a desperately disappointing night for the Cobblers.